The Guinness Storehouse in Dublin is a visitor attraction which is based at the old Guinness brewery in Dublin. Across six floors, it tells the story of Ireland’s most famous drink and how it came to be a favourite all over the world. You start at the bottom of the Storehouse building in a huge atrium shaped like a pint glass! From here you progress upwards, level by level learning about the brewing process and the history of the site. You’ll learn how Guinness is made, meet Arthur Guinness himself, hear how Guinness was transported around the world and look at some of the memorable advertising campaigns over the years too. The undoubted highlight is right at the end of your tour when you get to enjoy a pint of Guinness in the 360 degree Gravity Bar which is perched right on the top of the building. The views across Dublin are superb and we just didn’t want to leave. Of course, you can stay longer if you buy more Guinness! The Storehouse is Ireland’s top visitor attraction we were really impressed with it. We think it’s worth a visit just for the exhibitions, but on top of that you get the unexpected bonus of the Gravity Bar which is not to be missed – a truly fantastic view and a lovely atmospshere. 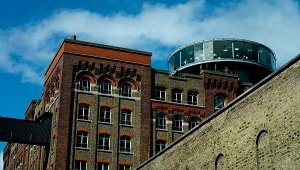 The Guinness Storehouse is open daily from 9.30am to 5pm (last admission is at 5pm). Late opening during July and August until 7pm (last admission is at 7pm). Adult tickets purchesed at the Storehouse are 14.40 Euros (2011 prices) but you can buy in discounted tickets in advance in US Dollars here and “Skip the Line”.